The RBFS Small Round Back Flood is a compact light ideal for site, landscape, flag pole, and general security lighting. The sleek curve and contemporary look make them more aesthetically pleasing than regular commercial floods. A number of shielding options are available for customized effects. 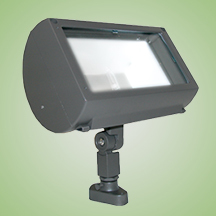 It is a compact light ideal for site, landscape, flag pole, and general security lighting. The sleek curve and contemporary look make them more aesthetically pleasing than regular commercial floods. A number of shielding options are available for customized effects. Available in 50W Mercury Vapor, 50W-100W Metal Halide, 50W-100W High Pressure Sodium, 42W Fluorescent, and 75W-250W T4 Quartz.